You have to make sure your walker is the right height for you. You should position the walker so your toes are in the center of the walker. Advance the walker about a step length ahead. Regardless if you’re on one leg or two, when using a walker, it needs to be adjusted to the right height. You want this so you can have the best leverage and most support. If your walker is too high, you’re not going to be able to use your arms to get the best leverage to support your body. Which means you won’t be able to walk well and may end up falling. If, on the other hand, its too low, you’ll find yourself bent over while trying to walk with your eyes facing the ground. While some people will do this, it’s not the best way to get around. To adjust the walker to the right height, stand straight up in the walker and let your hands drop to your sides. Then, adjust the walker height so that the handles are level with your wrists. This way of adjustment works best for most people. Along with having the proper height, you’ll want to pay attention to your positioning and distance from the walker. A lot of folks who have to use walkers seem to think “standing inside” is the right way to use it. But unfortunately, this is a misconception thats perpetuated by many physical therapists, sad to say. If you want the best positioning of the walker your hands will always be to the front of your thighs/hips when you’re holding the walker. Its sort of like standing at a counter. Your hands are in front of you supporting you. Think about it, when you’re “inside” the walker, your hands are more along the sides of your thighs/hips. This position is unnatural and throws off your balance. Plus, it brings you too close to the front walker cross bar. This causes you to bend forward in order to maintain your balance and gives you poor posture when using the walker. With the toes of your weight bearing foot one the floor in the center of the imaginary square/retangle made by the four legs of the walker, push the walker ahead of you about a step length. Lean forward onto your arms supporting your body weight through the walker. Step forward and avoid “hopping” with your other foot. When you consciously think about stepping rather than hopping, you use less energy and the movement is smooth rather than jerky. 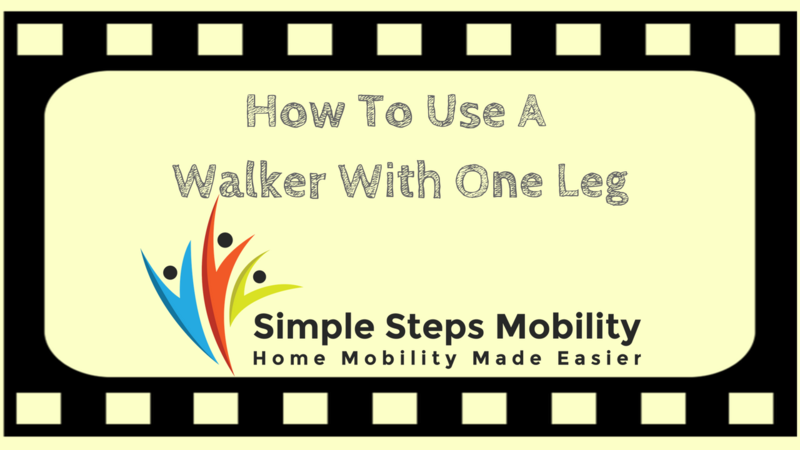 The video included on the page will show you how to use a walker when you have only one leg to work with. Remembering this along with the importance of proper walker height and walker positioning, are simple steps to using a walker with one leg.